A heavy artillery offensive by the Burma Army against a Shan armed group resulted in residents of nine villages being evacuated. Local sources told Karen News that following the Burma Army’s artillery bombardment on May 9 the Restoration Council of Shan State/Shan State Army’s (RCSS/SAA) abandoned its camp at Nan Khan Township, Northern Shan State. The RCSS/SAA’s spokesperson Major Sai Long Saei confirmed to Karen News that the Burma Army’s 145th Infantry Battalion based in Nan Kan, attacked its Nowma camp. Major Sai Long Saei said that the bombardment was the most serious fighting during the ceasefire period between the RCSS/SSA and the Burmese Army. Due to the conflict, civilians from Now Khan, Wan Tarhay, Hosai, Wankhon villages had to take refuge in China. 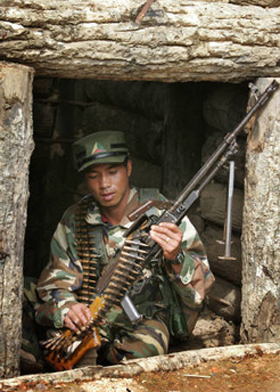 Shan Army officials said at least 10 soldiers from the Burma Army and one from the RCSS/SSA were killed in the fighting.